We reported about it before. Denmark is in desperate need of bike mechanics. 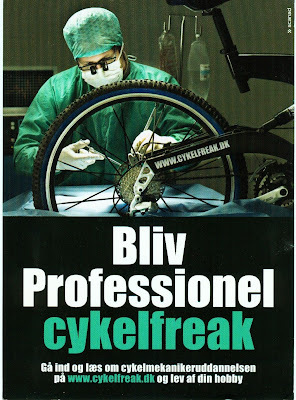 So much so that the organisation of bike shops - Danske Cykelhandlere - started a campaign with free café postcards aimed at getting young people interested in taking the bike mechanic education. "There is a big shortage of bike mechanics. The reason is that more and more bikes are being sold and they need to be serviced and repaired. In addition, bikes are becoming more advanced. Gone are the days when people used half a weekend to fix up their own bikes as best they could. They would rather send it to a mechanic. That's why the need for good bike mechanics is rising. Completing the bike mechanic education is quite like printing your own job guarantee, but it's close." With Denmark virtually at full employment (back in 2008, when this was first written), there are shortages in many areas of the workforce. Bike mechanics are no exception. The course takes three years. 40 weeks are in the classroom, the rest of the time is in an apprenticeship. With all that said, you don't HAVE to take the course to open a bike shop. Many immigrants open bike shops with their skills from their homeland. I find it a bit funny that the bike in the postcard is like nothing you see on the bike lanes in any Danish city, but hey. It's advertising.